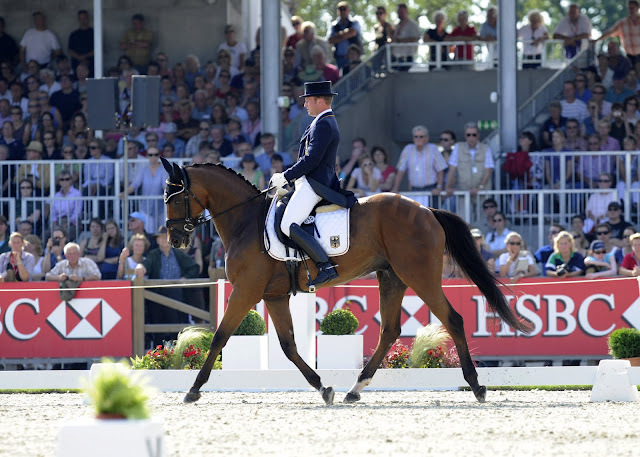 Germany’s Ingrid Klimke and FRH Butts Abraxxas lead the individual standings at the HSBC FEI European Eventing Championships and Germany is on top in the teams after the Dressage. Photo: Peter Nixon/FEI. Outstanding performances by Germany’s Ingrid Klimke and Michael Jung have put the home side into a fabulously strong position before tomorrow’s Cross Country phase at the HSBC FEI European Eventing Championships at Luhmühlen (GER). The host nation, bidding for a first European team gold since 1973, is now more than 20 penalties ahead of defending champions Great Britain as the first team to score under 100 in the Dressage at European level. The Italians, who won silver in 2009, hold a fractional advantage in third over Sweden, who last won gold back in 1993. Klimke is no stranger to brilliance in the Dressage arena, but even she was overwhelmed by FRH Butts Abraxxas’s mark of 30.0, which included six 10s: three for the entry and halt; two for her final halt and one, from Ground Jury member Christoph Hess, for her riding. “Hans Melzer [German team trainer] told me I should do a 29, so he put me under pressure,” Klimke revealed. The ever-smiling Klimke also admitted to despondency after her fall at Badminton (GBR) in April, in which she suffered a knee injury which kept her out of the saddle for 12 weeks. “I was very depressed about it all because I just love to ride,” she said. “But then Abraxxas was in good shape at Aachen and Mälmo and now I’m just thankful to be here. Michael Jung (GER) riding La Biosthetique - Sam FBW, 2nd place after dressage. Jung showed the mark of a World Champion, holding it all together to post a score of 33.3, despite a nervous start when La Biosthetique Sam broke in the first medium trot. Frank Ostholt (GER), who was also revelling in the atmosphere, chose a good day to score his first ever 10s, for his entry and for his final halt. He is now lying third on Little Paint. “I know I have a fantastic horse, but it’s another thing in the arena. However, I don’t think this is going to be a dressage competition,” he said. Frank Ostholt (GER) riding Little Paint 3rd place after dressage. Ostholt has been a member of the senior German squad since 1993, but individual glory has eluded him, his best result being fourth place at the 2006 FEI World Equestrian Games™ in Aachen (GER). Britain’s Laura Collett got her senior championship debut off to a flying start. She is lying equal fourth with Sandra Auffarth (GER). Her only mistake in a beautifully presented test was when her horse Rayef bounded forward in the second flying change. “He went to change early, I said ‘no’ and it all happened too early – he was a bit surprised,” explained the 21-year-old, who has already won Junior and Young Rider European titles on Rayef. If she completes the set this weekend, it will be a record. Ten riders achieved sub-40 marks. Stefano Brecciaroli (ITA), former dual European Champion Nicolas Touzaint (FRA), riding the relatively inexperienced Neptune de Sartene, and Mary King (GBR), who managed to contain the exuberant Imperial Cavalier, all pulled their respective team scores up. Like all riders, he is viewing Course-Designer Mark Phillips’s Cross Country track with respect. “There’s a lot of room for error, and it’s definitely got a sting in the tail,” he said. This is a reference to the penultimate combination, the Rolex Turn (fence 27) where a big ditch and brush is followed by a four-stride turn to a corner and another four strides to a narrow fence. The course runs in a reverse direction to usual, so even though Luhmühlen is a familiar venue for many, it will be a completely new test for all. Course-builder David Evans has excelled himself with his trademark carvings, which include fishing bears in the pool at the far end of the course from which spectators can see seven fences. The ground is perfect, the weather is forecast to cool down, and, although the Germans appear to be running away with the medals, they know accuracy and focus are key. “Horses will need to be able to see exactly where they are going and riders will have to be precise,” warned Ingrid Klimke. Her father, Dr Reiner Klimke, was the most medalled Dressage rider of all time; how proud he would be to see his daughter add a couple of gold medals to the family trophy cabinet in this thrilling HSBC FEI European Eventing Championships, the marks the 30th of these Championships.